Marie came to Ingmar Bergman’s English language film The Serpent’s Egg with no prior knowledge or expectations – and was glad she gave it a go. New from Arrow Academy on Blu-Ray. Shakespeare uses the term ‘Serpent’s Egg’ in his play to describe Julius Caesar – a leader who hasn’t yet abused his power, but who he feels is just waiting for the right moment to hatch and wreak real havoc on an unsuspecting world. In Ingmar Bergman’s 1977 film The Serpent’s Egg, we see the very beginnings of what will eventually become National Socialism under Adolf Hitler – although at the time in which the film is set, those events are still 10 years away, but they are beginning to bubble away. In The Serpent’s Egg, Bergman’s only film completely in the English language, David Carradine is Abel Rosenberg, an alcoholic American trapeze artist on the down and out in Berlin in 1923. He comes home one evening to find that his brother has committed suicide, which forces him to make contact with his former sister-in-law Manuela, played by Bergman muse Liv Ullmann. Manuela is scraping a living as a burlesque dancer and part-time prostitute, but is still doing better than Abel, and the two find shelter together in a Berlin which is rotting both as an economy and as a society following the end of the First World War. I read that Bergman himself didn’t regard this as one of his good films, and the critical reception at the time was not too positive. It may not be what one immediately thinks of when the name Ingmar Bergman is mentioned, however it’s a very pointed view of the surveillance state and racism which is all too relevant to today. For 1977 audiences the narrative may have gone wildly off-piste in the third act, but watching it now it only seems to reinforce the darkness of the overarching themes. As usual, Liv Ullmann cannot be faulted for her performance as a woman struggling to get by using whatever means are at her disposal. It’s a character that asks different things of Ullmann that we might have come to expect, and she does not fail to deliver, even in a language which is not native to her. David Carradine is sensational in his self-hatred, and so much better than I was expecting. The supporting cast, some of whom have only a small amount of screen time, also contribute a lot to the final product. Extras on this new Blu-ray release from Arrow Academy include an audio commentary by David Carradine himself, an appreciation by critic and Bergman aficionado Barry Forshaw, archival interviews with David Carradine and Liv Ullman and an archival interview with Marc Gervais on the topic of German Expressionism. 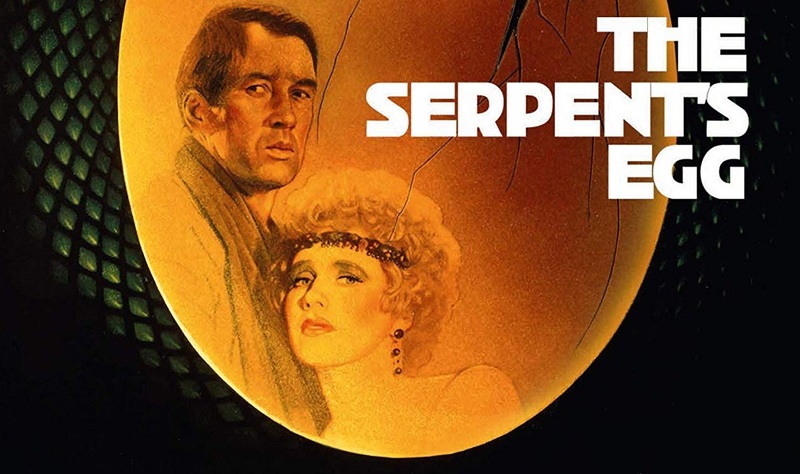 I came to The Serpent’s Egg with no prior knowledge of either its themes or its reception at the time of release and was struck by how engaging it actually was. Where it ends up seems miles away from where it begins, but this only adds to the paranoia and oppressiveness, and I was glad I gave up the time to watch it.